2019 Q1 'Double Take' global promo, 19 Mar - 4 Jun, register from 5 Mar. ATTENTION!!! Many Users are reporting error when trying to enroll. The only option right now is to call Marriott if that is happening to you. Registration for the Double Take global promotion begins on 5 March, 2019. Registration of your Marriott Bonvoy account is required. 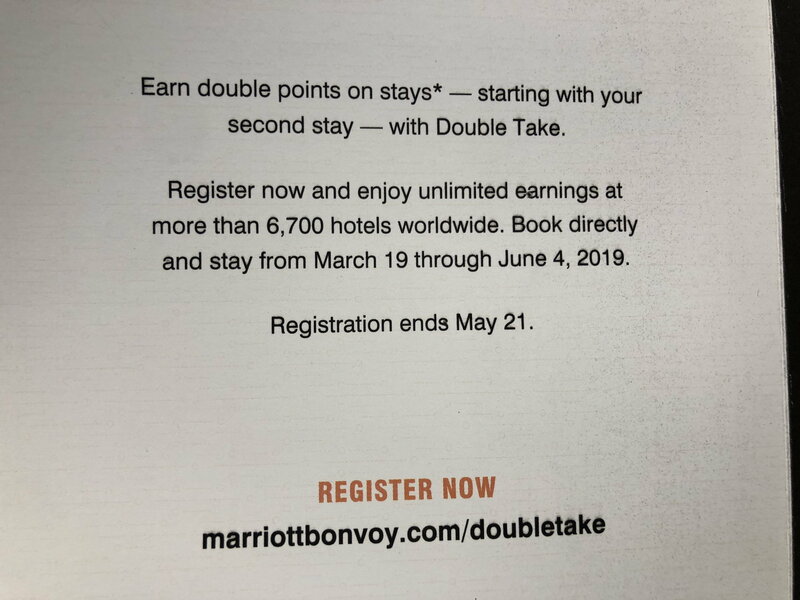 Marriott Bonvoy™ members who register for this promotion by May 21, 2019 will earn double points per stay, starting with their second stay during the promotion earning period. The double points earning is only applicable to members’ base points earned per stay. The promotion earning period is for stays between March 19, 2019 and June 4, 2019, at participating Marriott Bonvoy™ properties. A 'stay' is defined as consecutive nights spent at the same hotel, regardless of check-in/check-out activity. Rooms booked through most third party online retailers and select travel agency bookings are ineligible to earn for this promotion. The member receiving this offer has been targeted and the offer is not transferable. ExecuStay, Marriott Executive Apartments and Marriott Vacation Club® owner-occupied weeks are not eligible for bonus points and nights spent while redeeming an award are not eligible for bonus points. Only one room per hotel is counted toward a member’s nights or stay. Members electing to earn miles are not eligible for this promotion. For a list of current participating brands, visit www.marriott.com/loyalty/earn/hotels.mi. All Marriott Bonvoy™ terms and conditions apply. See www.marriott.com/loyalty/terms/default.mi for more information. Visit marriottbonvoy.com/DoubleTake or call 888-MARRIOTT (888-627-7468) for complete details. As part of this promotion, Marriott Bonvoy members who are the primary account holder of a U.S.-issued Marriott Bonvoy co-brand credit card (Marriott Bonvoy Brilliant™ American Express® Card, Marriott Bonvoy Business™ American Express® Card, Marriott Bonvoy™ American Express® Card, Marriott Bonvoy Boundless™ Credit Card from Chase, Marriott Bonvoy™ Premier Credit Card from Chase, Marriott Bonvoy™ Premier Plus Business Credit Card from Chase, Marriott Bonvoy™ Credit Card from Chase, Marriott Bonvoy Business™ Credit Card from Chase and/or The Ritz-Carlton™ Credit Card from JPMorgan) will earn 500 bonus points per weekend stay, including the first weekend stay, at participating Marriott Bonvoy properties during the promotion earning period. A ‘weekend stay’ is defined as a stay that includes a Friday or Saturday night regardless of where the hotel is located. The 500 bonus points per weekend stay is in addition to any double bonus points earned. Marriott Bonvoy member’s card account must be open as of May 21, 2019 in order to qualify for the Card Member bonus. To be eligible to receive the Card Member bonus, Card Member must have an active Marriott Bonvoy member account linked to their credit card that was used to register for this promotion. Bonus points will be awarded to the member’s account up to six weeks after the promotion ends. Q : Does a 1-night stay count as the first stay ? A : Yes, this would count as the first stay as long as the one night falls within the promotion period. Q : Does an award stay count as the first stay ? A : No, full award stays do not count towards this offer as a first stay. Q : Does a stay that straddles the start / end date of the promotion period count ? A : If you check-in before March 19 but check-out after, that stay will count as a Double Take stay. Likewise, if you check-in before June 4, that stay will count as a Double Take stay, even if you check out after. Q : Which points are doubled ? A : Double points are only applicable to the base points you’ll earn on a stay. Q: If a member is enrolled in both Double Take and "Exclusively For You: Double Points" promotion, will they earn for both promotions? A: Yes, if the Stay meets the qualifications for both promotions, the member will get quadruple points. 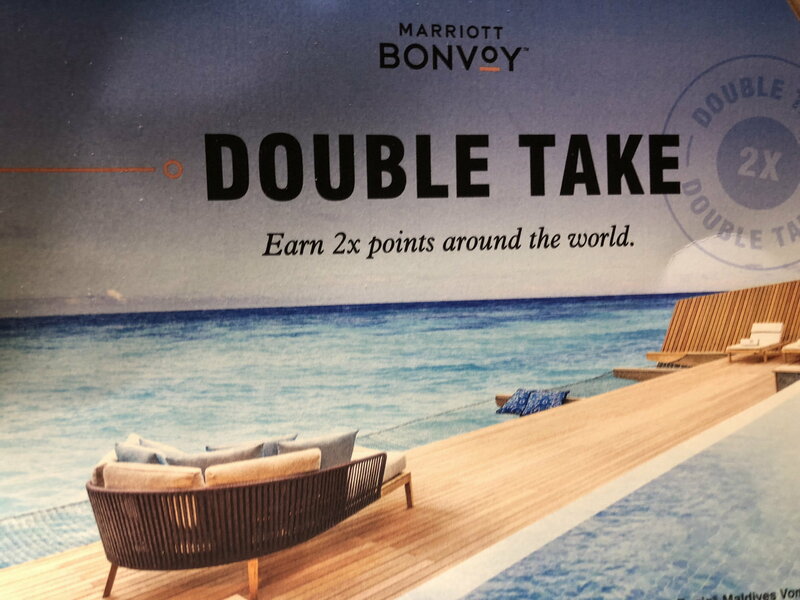 I received a mailer advertising a Q1 campaign for ""Double Take / Earn 2x points around the world." Requires registration at marriottbonvoy.com/doubletakeGoing to that url immediately redirects to https://www.marriott.com/loyalty.mi, where there is no reference to any such thing. Has anyone managed to register for this? Double Points would be welcome! Would be a nice change I think. Do you have a pic of the mailer? Interesting let’s see what comes of it. Better than nothing, but again that horrible "starting from second stay". No surprise that the website isn't live if the promo only kicks off on 19 March. At least we don’t have to hotel hop with this one. Duke787 and secretalcoholic like this. I hope there aren't any property exclusions, like SPG had. maybe because i’m running for Plat challange ? Then why do they say "register now"? I called MR-- they told me no reward promo for me. She indicated it was because they were rolling out their new Bonvoy program. Really? That's the excuse? I've already moved a few nights to priority club as they have some ridiculously easy ways to earn about 40,000 bonus points for just a few stays. I'm already lifetime Titanium Elite so no need for me to build nights with Marriott. OP what does the asterisk stand for on the word stay? what’s the definition of stay for the purpose of this promotion? I’m guessing paid stay, of course. But is it minimum 1 or 2 nights?